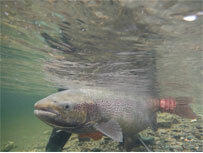 A new concept in salmon sport fishing in Quebec. The development of a product offering a world class recreational and sporting destination in the Gaspé. 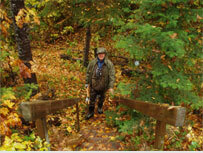 A diversity of activities offered to clients around the Gaspé Peninsula (fishing, tourist attractions). The essential feature to welcome and take care of clients during their stay. The uniqueness of offering, as the permit holder for purveying services to all Gaspé Peninsula (zone 01 & 02) salmon rivers. The authorization, by the "Ministère des ressources naturelles et de la Faune du Québec", to offer salmon fishing guide services all over the territory. Guides offering continuous assistance and support in a relaxed atmosphere, which is condusive to a favorable ambiance. 24 hour assistance as to needs. Other tourist related activities: visits, field trips, wildlife observation,etc. 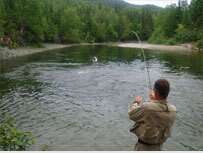 Fishing on the best available river in the Gaspé. Participation in 48 hours' draw on productive rivers. 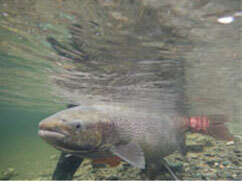 Full breakdown/motivation of all costs pertinent to salmon fishing. Access to all client destinations. Partnership with Fishing Zone Operators in the Gaspé. Respect of laws and the environment. Professionalism: expertise, training, fishing techniques, etc. Sharing knowledge, pleasure fishing, relaxing and living in harmony with nature.